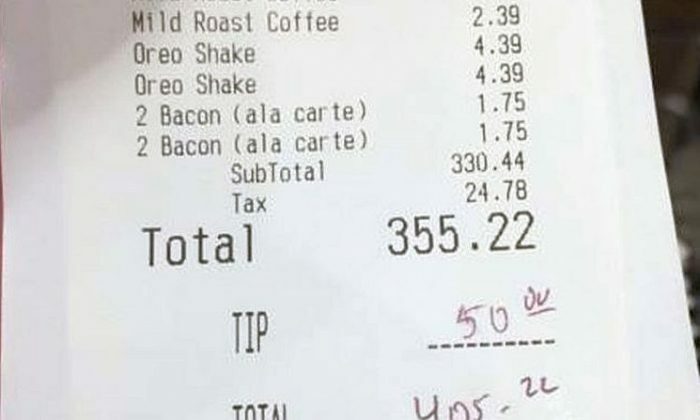 A woman at a Denny’s restaurant decided to pick up the $400 tab for a group of firefighters who came in to have dinner, after battling a blaze. That blaze was the La Cadena Fire in La Loma Hills, according to the Colton Fire Department’s Facebook page, and was successfully put out. Around 25 firefighters were eating at the local restaurant when the women, who wanted to remain anonymous, told the staff she would pay for the firefighter’s meals. It was a way for the anonymous woman to show her appreciation and gratitude for the firefighters who risked their lives on duty serving the community. Not just in Colton, California, but all across America. Not only did the women the over $400 meal tab, including tip, she also paid an additional $100 so that every member could enjoy dessert. “We thank you for your generous show of support,” reads the Facebook post from the Colton Fire Department, on behalf of all the firefighters who were fighting the La Cadena fire and other fires in the area. “We are all honored to serve the citizens of our communities,” the post reads further. Colton Fire Department spokesman Capt. Tom DeBellis said these acts of kindness from the local community were not unheard of, but always greatly appreciated, according to The Press-Enterprise. “Very nice thing to do. Makes the world a better place!” read one Facebook comment under the fire department’s post. Clearly an act of kindness can go a long way to making a person’s day, or in this case, successfully making the days of 25 firefighters.